Why it’s important to engage them. 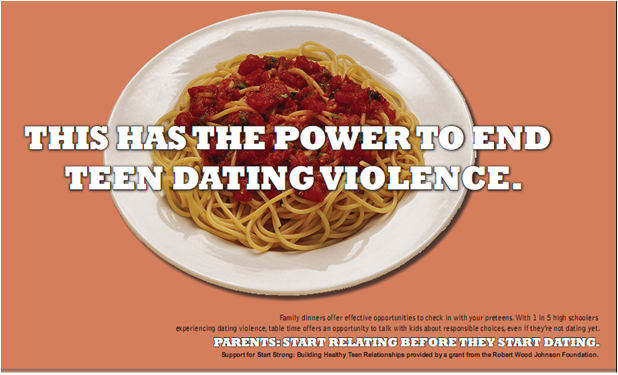 When parents talk to their kids about healthy relationships, they help protect kids from dating violence. Middle school is the right time to have those conversations. Even as young teens are moving towards stronger peer influence, they are still listening to what their parents have to say. In fact, an independent evaluation of the Start Strong program showed that positive parent-child communication predicted positive healthy relationship outcomes among youth. What stands in the way. Most parents of 11-to-14-year-olds don’t feel prepared to talk to their kids about healthy relationships and teen dating violence. They may not even want to acknowledge that their kids have started dating. And, they may not understand that controlling behaviors and bullying in pre-teen relationships can lead to dating violence and other harm later on. Show Parents Why it Matters: Most parents don’t rank teen dating violence high on their list of concerns, but they are more likely to get involved once they understand that preventing teen dating violence can help protect kids from other dangers parents already worry about, like substance abuse and risky sexual behavior. Build Parent Confidence: Most parents feel uncomfortable talking about relationships or dating violence with their children. They need tools to help them start the conversation—including what words to use and how to recognize warning signs. 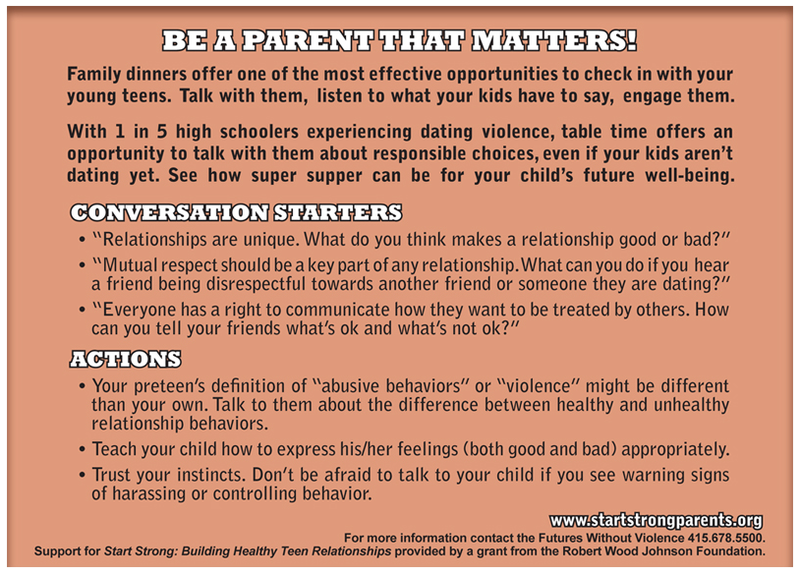 Parents need to learn to talk about healthy relationships, not just tell their kids what not to do. Make it Easy for Busy Parents: Getting dinner on the table is hard enough! Busy parents need help overcoming practical obstacles to their participation. For Start Strong sites, offering food and childcare at events always boosted parent attendance. Team Up: Partners like school resource centers, parent-teacher organizations, and student performance groups can help you get started. If parents are already coming to the school for an event or activity, see if you can become part of the program. Start Strong Bronx conducted a parenting program at a school when parents were already there to pick up report cards. The school required attendance at the workshop in order for report cards to be released. Start Strong Austin conducted workshops addressing social emotional learning, positive parenting and healthy teen relationships for parents of youth transitioning from elementary to middle school. These workshops were so well received they became an integral part of transition camps at middle school campuses.